The State Controller is the State’s Chief Fiscal Officer. 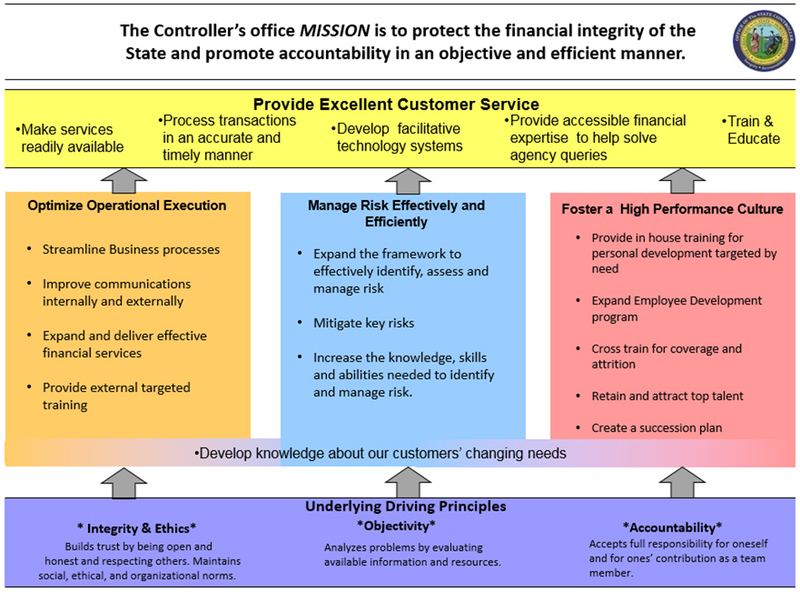 The Controller serves as an independent resource to protect the financial integrity of the State and to promote accountability in an objective and efficient manner through its accounting, disbursing, payroll, internal control, data management, eCommerce and financial reporting systems. The basis for the Controller’s authority is statutory, and the Controller manages 14 Enterprise programs. The State Controller is appointed by the Governor and confirmed by the Legislature for a seven-year term. Dr. Linda Combs is the sixth State Controller and the first woman to hold the office. She was unanimously confirmed by both the House and Senate in 2014. OSC carries out its enterprise wide duties at minimal cost to the taxpayers. Below is what is known as the OSC Success Map. It illustrates the agency's mission, vision, and values.